This butterfly looks so drab until he opens his wings and reveals his hidden beauty. It was there all the time but we couldn’t see it. I haven’t been able to identify this butterfly that I photographed this past weekend in a meadow in Massachusetts but like the way the shot turned out. 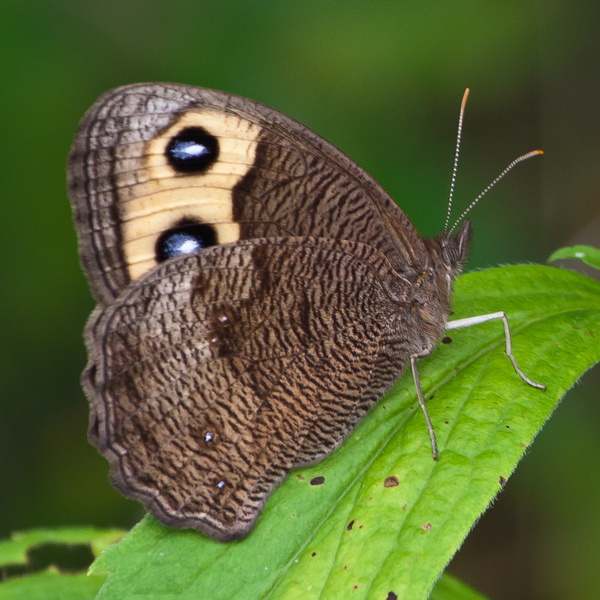 UPDATE: I am now pretty sure this butterfly is a Common Wood Nymph (Cercyonis pegala). Check out the Butterflies and Moths of North America website for additional details. How much beauty do we miss each day because we fail to see past the ordinary exteriors of things (and people) in our lives and neglect to look more deeply? 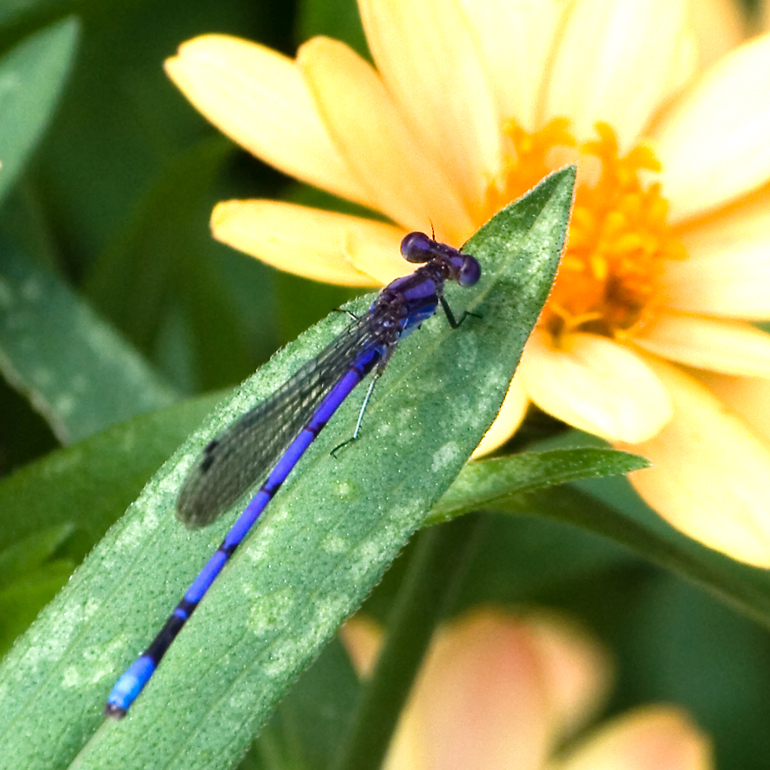 My eyes were so attuned to dragonflies yesterday that my first thought when I stumbled upon this insect perched at the top of a plant was that it was a tiny dragonfly. The pose especially looked familiar. The more I looked at it, however, the more I realized that the legs and winds were all wrong and the head, which in this profile shot looks a bit like a dragonfly’s, was really different. From another angle it sort of looked like a fly, but not any fly that I had ever seen. What is it? 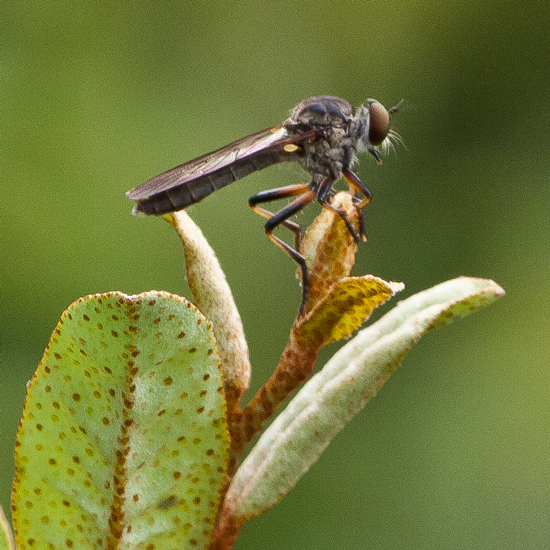 I think that what I have here is a robber fly (from the insect family Asilidae). So far I have not been able to get any more precise in identifying this guy’s species. The description of robber flies in Wikipedia, however, is pretty. scarey. Yikes! That description alone is enough to bring back flashbacks of alien movies and zombie thrillers. I may not sleep well tonight. 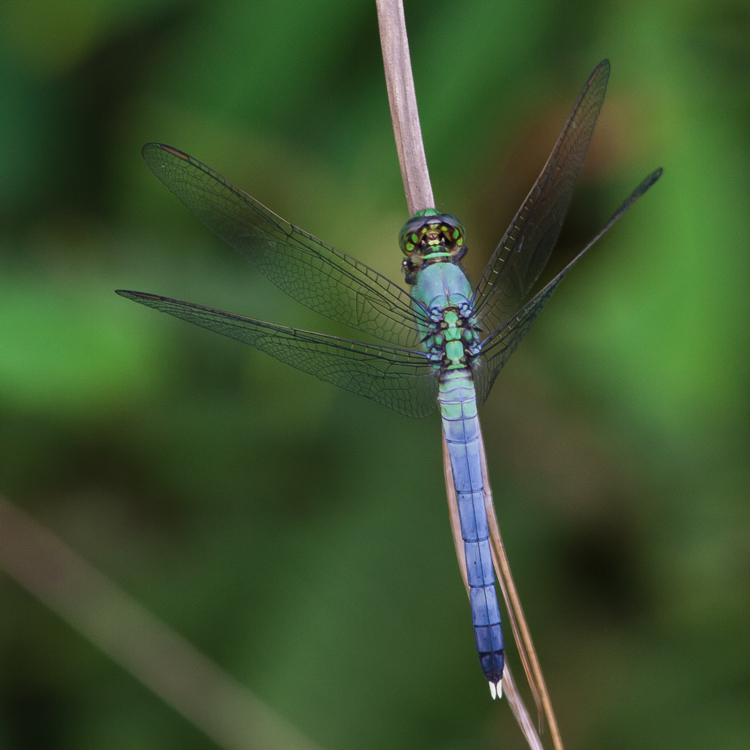 Is a Blue Dasher always blue? I know that this sounds like a trick question but I asked myself this very question when I encountered the dragonfly pictured below this afternoon. 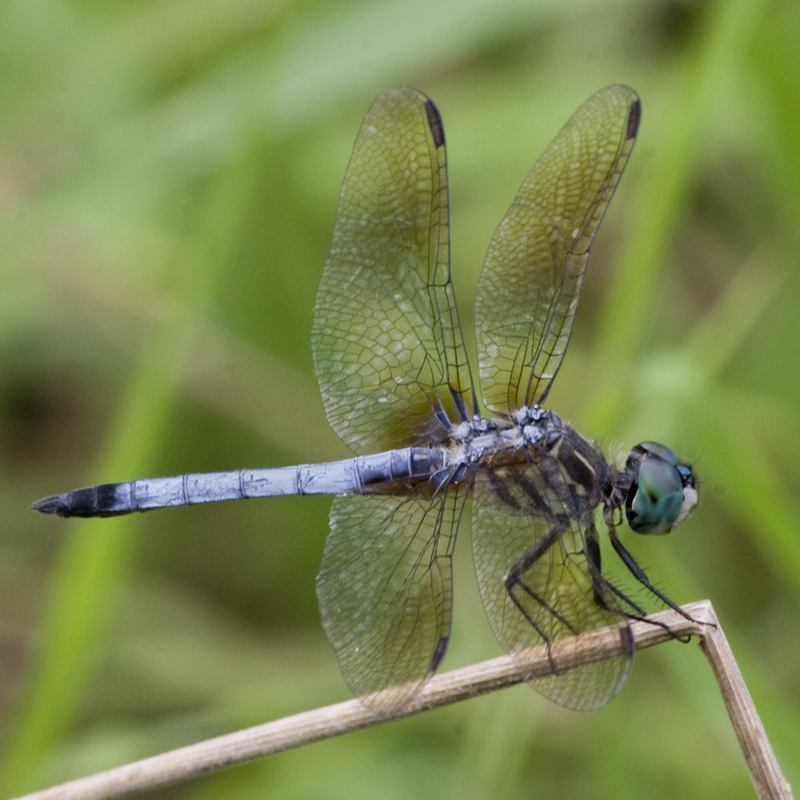 I have had lots of practice observing and photographing Blue Dasher dragonflies (Pachydiplax longipennis) and they have always been blue. From the “waist” up this looks like a typical Blue Dasher with the distinctive chest markings. (I realize that I am not using the anatomically correct language so I apologize if anyone is offended by my ignorance.) The tail, though, is completely different in color—it is not blue. 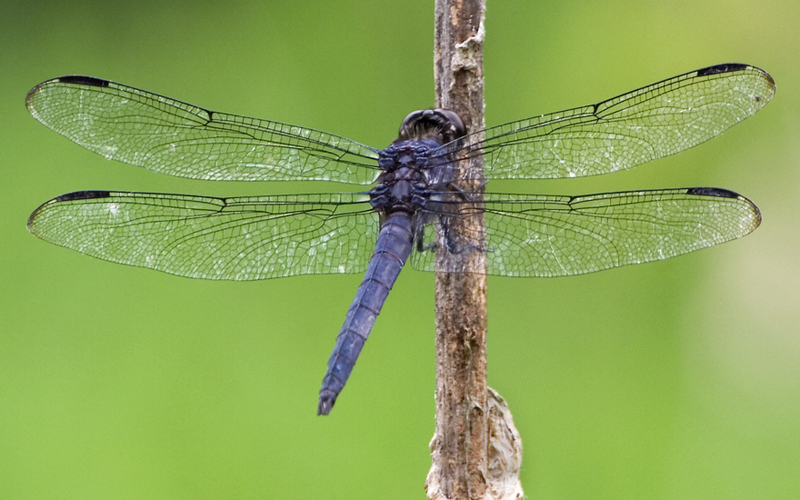 A little research on the internet reveals that the female Blue Dasher, as shown above, is not blue. She (and juvenile males) have the yellow stripes on the tail as shown. I am still left wondering, though, about the male-female ratio for Blue Dashers and have no explanation why until now I have seen only males. 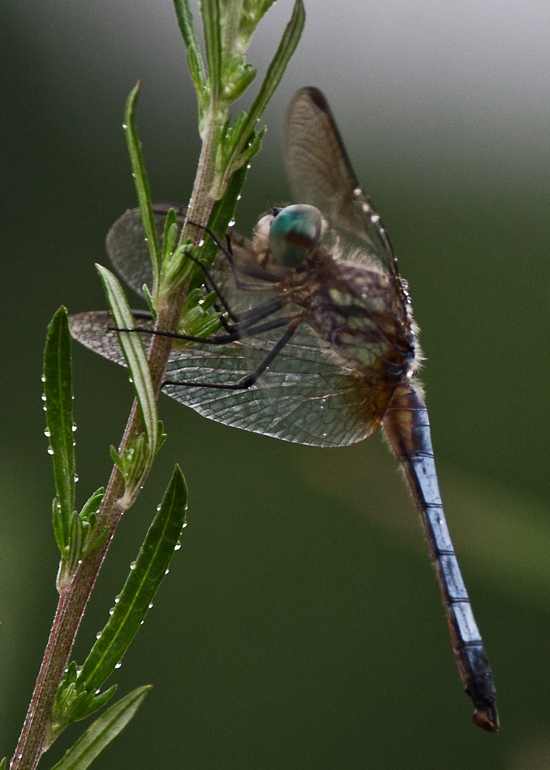 I will leave you to ponder that mystery as you look at one of my favorite photo from yesterday of a male Blue Dasher. A flash of emerald green whizzed past my eyes as I was walking in a meadow near my hotel in Massachusetts. What could it be? I waited a few minutes and recognized the familiar flight patterns of a dragonfly. Most of the dragonflies that I see are drab by comparison with this one that is almost tropical in the brightness of its color. 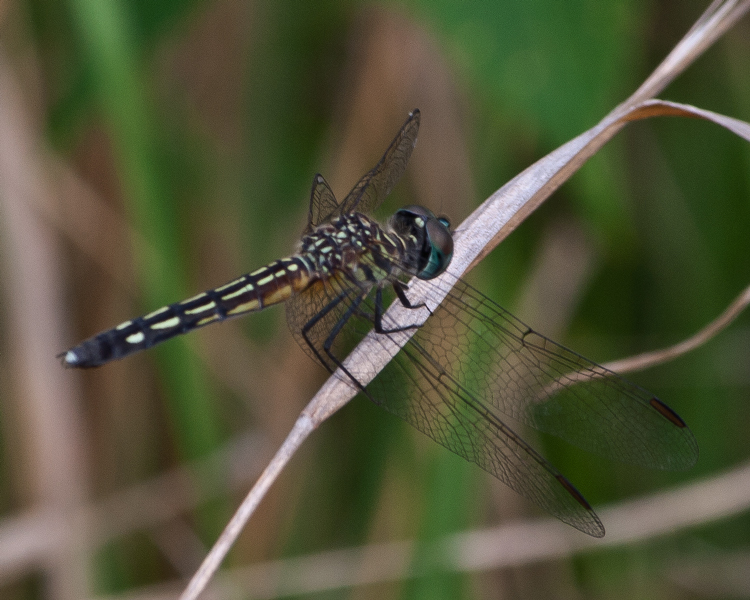 I am pretty sure this is a female Eastern Pondhawk (Erythemis simplicicollis). For more details about this dragonfly check out BugGuide. I stayed for a while longer in the meadow to see what else might appear and was pleased when a pretty bluish-green dragonfly flew into view. At first I thought it was a Blue Dasher but after examining him more closely I realized he was a different type. 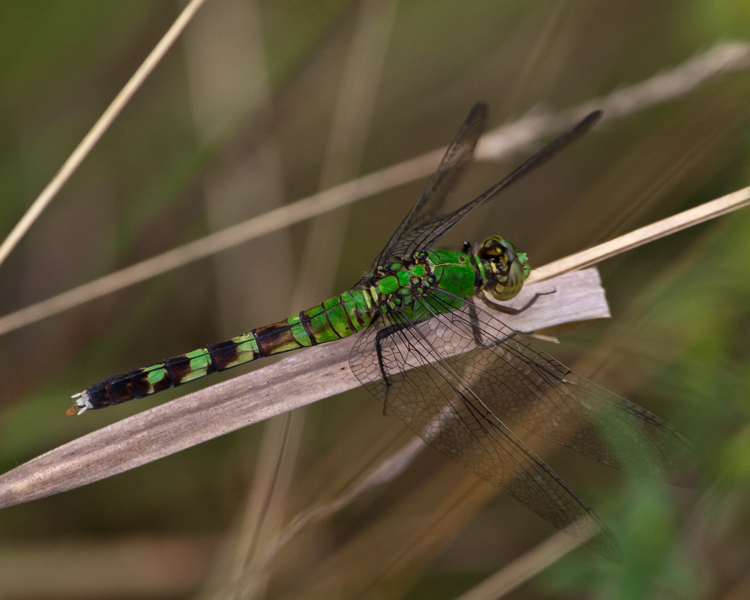 I think he is a male Eastern Pondhawk (Erythemis simplicicollis). 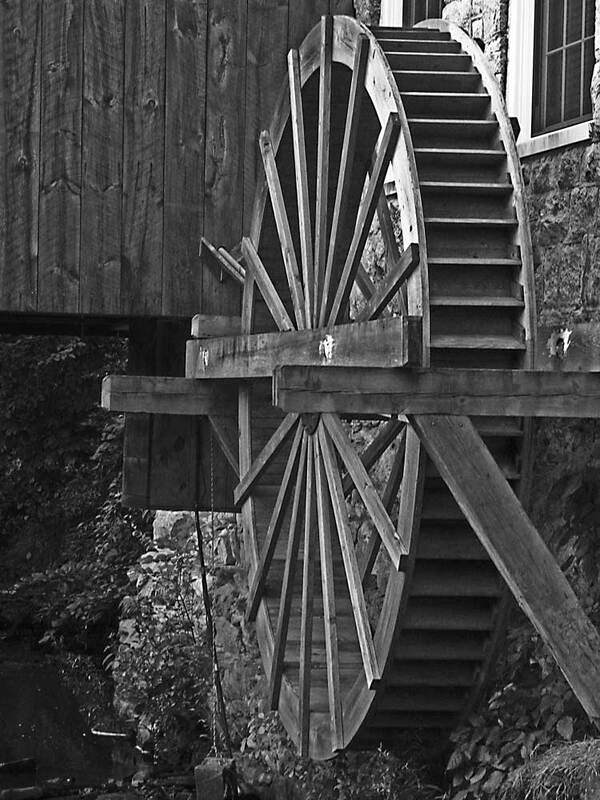 On an early morning walk today I saw this old mill, which has been converted to a restaurant. I currently am in Franklin, Massachusetts for a few days for a family wedding and somehow this mill reminds me of historical New England. Although I have no experience photographing buildings or converting images from color to black and white, I decided to step out of the comfort zone that I have established recently shooting insects, flowers, and wildlife and try something totally different, including using a different camera (a Canon Powershot A620 instead of my usual Canon DSLR). I am moderately satisfied with the resulting photos. Putting aside the results, though, I am happy that I was willing to risk failure by trying something new. As the old saying goes, the only way for a turtle to make progress is to stick his neck out. It’s easy for me to identify the dragonfly in the middle as a Blue Dasher but I have not yet been able to identify the other two insects by name. For now they will have to remain strangers, nameless but beautiful. 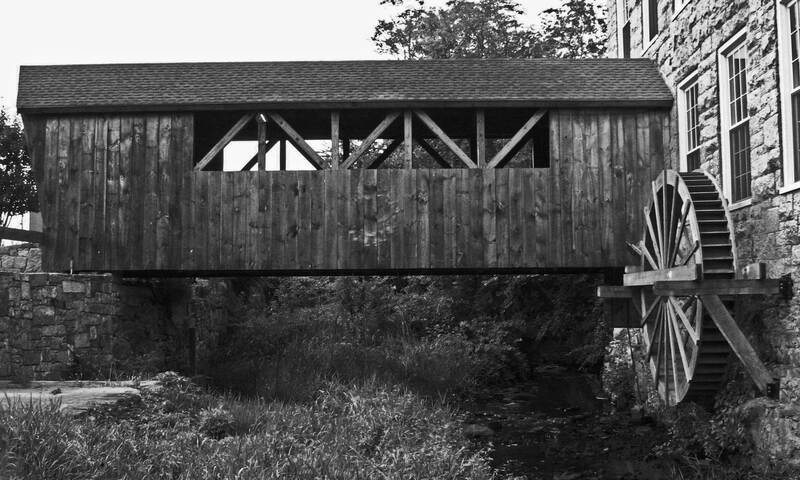 What do you want to emphasize in a photograph that you display to others? It is a creative choice that each of us faces every time we take a photo or manipulate an image. I enjoy shooting subjects with friends and comparing our results. Earlier in the week I was with Cindy Dyer, my photography mentor, and spotted an interesting looking little beetle on a plant in her garden. 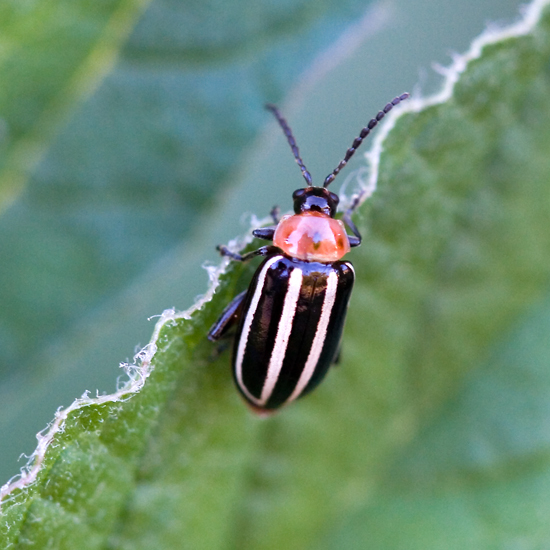 I did not have my macro lens on my camera and suggested that she photograph the little striped beetle, a type she had never previously encountered. 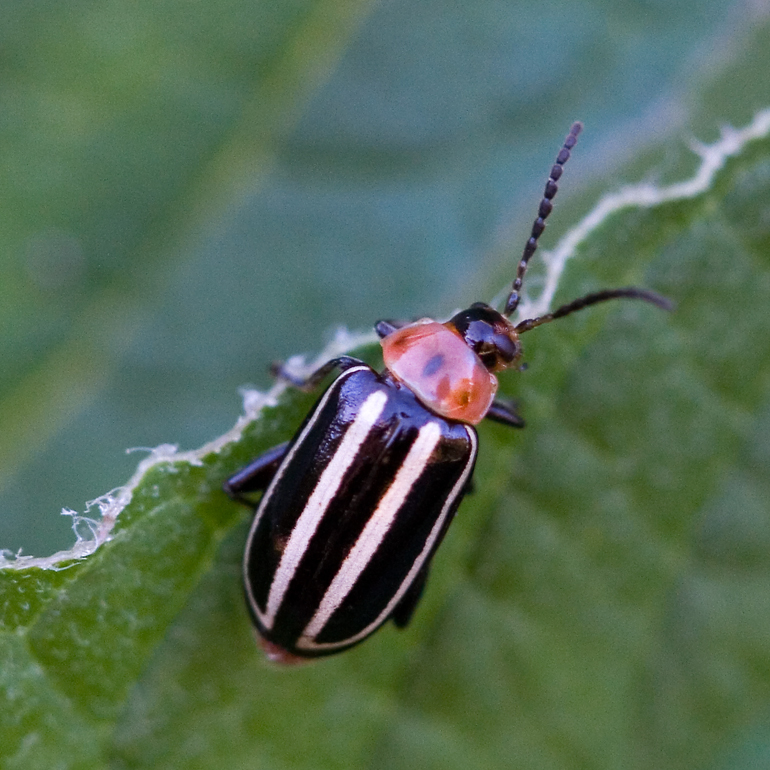 She later identified the beetle as a Striped Cucumber beetle (Acalymma vittata). 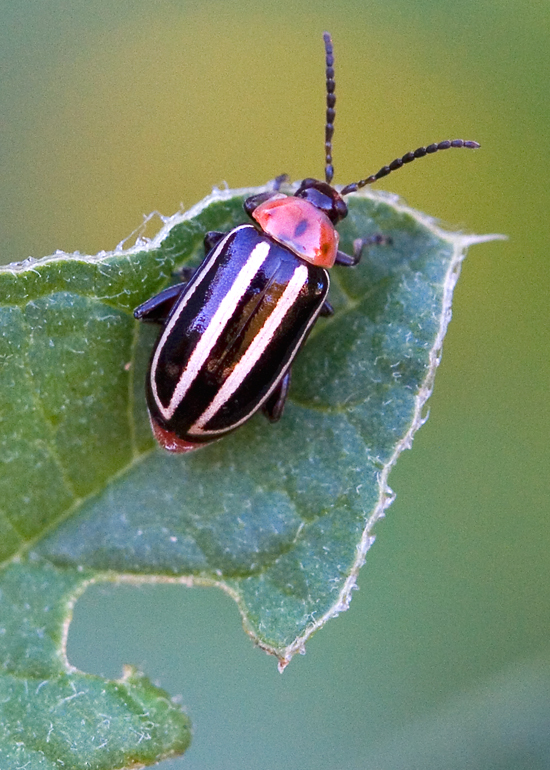 Cindy took a wonderful photo of the beetle staring over the edge of a leaf and entitled her posting “The Abyss.” Her photo is graphic and colorful and full of a sense of mystery and contemplation. I took some photos this evening of what is possibly the same beetle. I tried to convey the same impression that Cindy did in my second photo below, but that was not really what I wanted to stress. This first photo shows my “take” on the subject. 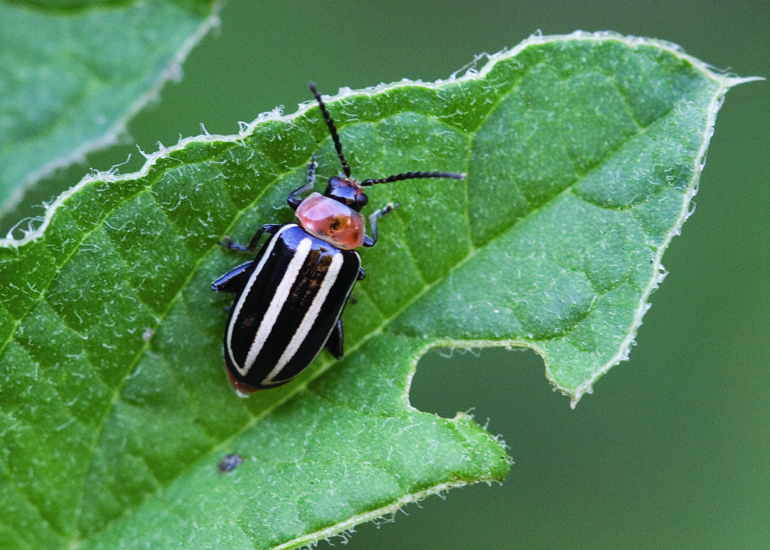 I decided that I wanted to contrast the beauty of the beetle with its destructiveness and chose to include the damaged leaf in the initial photo that is most prominently featured on the blog. The rest of the photos are variations of the themes of beauty and destruction, sometimes depicting only one of the two themes or juxtaposing them both in a single frame. Our choices influence how our viewers are likely to react to our photos. It is liberating to have that kind of creative freedom. It is who we are and what we do.